Two of our brightest stars were recognized at the State sponsored Higher Education Appreciation luncheon today. 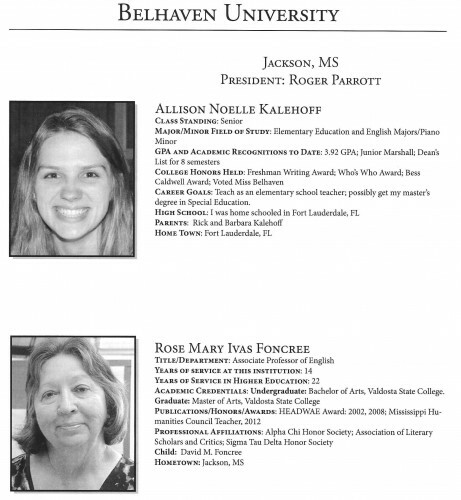 Congratulations to Prof. Rose Mary Foncree, and senior, Allison Kalehoff. They made us proud. The awards were presented by Lieutenant Governor of Mississippi, Tate Reeves. The speaker was William Bennett, former Secretary of Education, and best selling author. The Mississippi Arts Commission revamps its Governor’s Awards for Excellence in the Arts ceremony this year, marking its 25th anniversary and streamlining it for radio and TV. The hour-long ceremony, 1 p.m. Thursday at the Belhaven University Center for the Arts, is free and open to the public, as is a reception following at the neighboring Junior League of Jackson. The ceremony will be carried live on Mississippi Public Broadcasting Think Radio and taped to air at 8:30 that night on MPB. 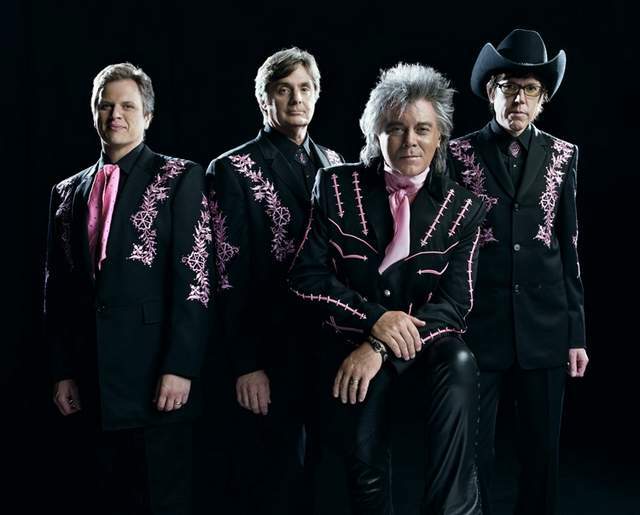 Country music star, multiple Grammy winner and 1999 Governor’s Award recipient Marty Stuart will host the event and his Fabulous Superlatives will serve as its house band. The five 2013 award recipients are: blues entertainer Bobby Rush, for lifetime achievement; Eddie “Chank” Willis, one of the main architects of the Motown sound, for excellence in music; playwright Beth Henley, for excellence in literature; Bay St. Louis Little Theatre for arts in community; and theater educator and Telling Trees Project founder Kathryn Lewis. “Honestly, this show is really about the recipients, and that’s what we wanted to focus it more on,” said Susan Liles, Mississippi Arts Commission public relations director. Presenting the awards at a more performance-oriented venue, the 800-seat Belhaven University Center for the Arts, is also part of that move. In previous years, programs stretched from two to two-and-a-half hours long. Liles said the Fabulous Superlatives will perform opening tributes to each recipient, and a couple of special performances are planned, too, including from Bobby Rush. Poetry Out Loud national champion and two-time state champ Kristen Dupard, now a freshman at the University of Southern Mississippi, will also be part of the ceremony. Doors open at noon Thursday for the event. We are headed into the best season of Belhaven University as so many of our Arts schedule major performances during the second half of the spring semester. Did you know you can get FREE TICKETS? And the majority of our performances are free to the public as well. And for the dance and theatre productions that require tickets, the prices are not that high and you’ll get to experience some top level performances. Graduating BFA students proudly present creative original senior projects exhibiting the culmination of their dance studies. Come experience the passion and maturity evident in these inspiring young performers and choreographers. Free to the public. Dr. Christopher Shelt, a teacher-performer professor of 14 years at Belhaven University sings an entertaining concert with selected students from his studio, past and present. It promises to be an evening that celebrates the teacher student relationship with ensemble singing from many genres and styles. Free to the public. Dr. and Mrs. Sachs (The Sachs Piano Duo) offer a duo/duet/solo recital of repertoire including I Got Rhythm Variations by George Gershwin, Concerto for Two Keyboards in C Major, BWV1061 by J. S. Bach, Fantasy in F Minor, Op. 103, D. 940 by Franz Schubert, a “monumental” work by P.D.Q. Bach and some “finger buster” etudes. Free to the public. Come and enjoy a colorful and beautiful showcase of string solos, string chamber groups, and the Belhaven String Chamber Orchestra that features our University’s outstanding string students performing in a variety of settings.Free to the public. Excitement through sound is in store for you as the full range of instrumental timbres, color, and energy flow under the baton of Dr. Paxton Girtmon and Mr. Owen Rockwell. Free to the public. Dr. Rebecca Geihsler, accompanied by BU Staff Accompanist Mr. Tyler Kemp, will present a solo voice recital including works by Mozart, Debussy, Wolf, Blumenkrantz, and featuring Lori Laitman’s “I Never Saw Another Butterfly,” a song cycle for voice and saxophone based on poetry written by children at the Terezin ghetto during World War II. Free to the public. Based on the story of the real life Louis de Rougemont, a self-proclaimed explorer who became famous for the story of his adventures in the islands of the south Pacific published in The World Wide Magazine at the turn of the century. After his story is called into question, the magazine quipped, “Truth is stranger than fiction/ But De Rougemont is stranger than both.” This highly theatrical presentation of his life’s stories celebrates the child-like wonder of magical storytelling. 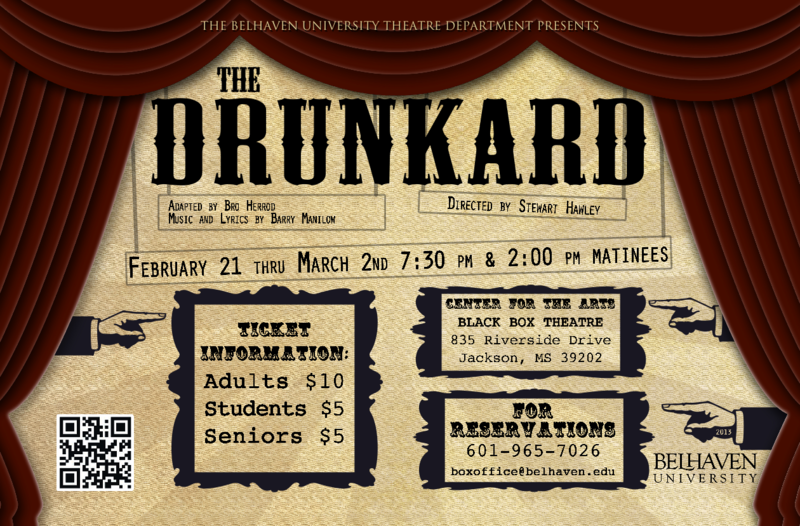 Directed by senior theatre major Anna Rebmann. Free to the public. 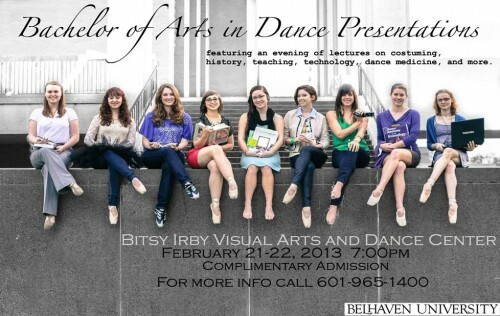 A fun-filled choreographic production for the entire family by the Belhaven University dance faculty performed by the Belhaven University Dance Ensemble. Complimentary admission for Belhaven Faculty/Staff/Students and immediate families. 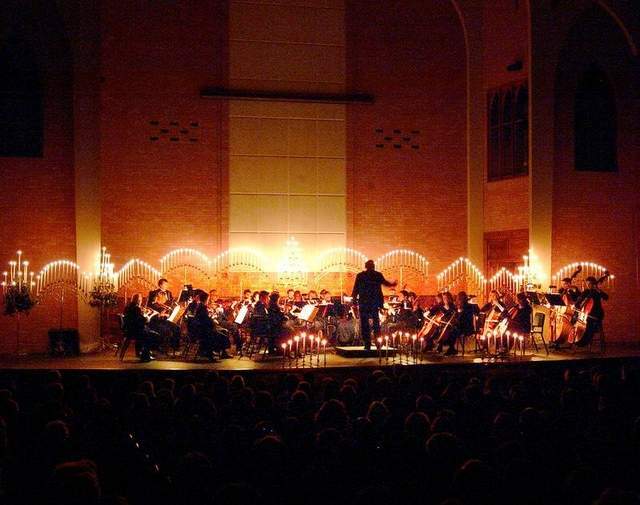 Come and enjoy an evening of symphonic orchestra music. The program includes works by such great composers as Beethoven, Tchaikovsky, Bizet, R imsky-Korsakov, and Grieg. Dr. Paxton Girtmon and Mr. Song Xie share the baton! Free to the public. A full week series of theatrical events – from featured guest artists, student performances, staged readings, senior recitals, class showcases, workshops and presentations. The full Festival schedule to be announced in the spring; contact the Theatre Box Office for information. Free to the public. Assisted by the Belhaven University Jazz Ensemble, the 80 voices of the Belhaven Concert Choir and Belhaven Chorale, along with soloists and small ensembles take to the stage for an evening of jazz and jazz influenced styles. Dr. Christopher Shelt conducts the Belhaven Concert Choir, Chorale, soloists, and small ensembles. Free to the public. The Music Department presents the most outstanding performances of the semester on one concert. Musical variety and excellence are the gifts from our student performers to you. Free to the public. Our friend Newt Wilson and his wife Becky need the prayers of our Belhaven family. Newt served as president from 1986 to 1995, and now serves on our Board of Trustees. He was also dean at Belhaven, a faculty member, and began at Belhaven as student. I talked with Becky earlier this evening and she shared with me that Newt’s condition is serious but hopeful – they need our focused prayer. Newt has autoimmune hepatitis and they are hopeful that he will receive a liver transplant. They will meet with a specialist at Tulane Medical School in two weeks, but first, they need to stabilize Newt’s severe abdominal infection. Their immediate concern is that Newt will be able to begin eating solid food again, and the antibiotics will eliminate the infection in order to clear the way for the possible liver transplant. He is expected to be released from the hospital on Friday, but that will be determined by how he progresses in the coming hours. Newt and Becky have given their lives for Belhaven University and right now, need our prayers. I hope you’ll join with me in supporting them in prayer during this difficult challenge. I have served for many years on the board of Lausanne, and also as an officer of the movement, serving as Treasurer. Doug Birdsall, who has led Lausanne, will begin a new ministry role as president of the American Bible Society. Doug is a long time personal friend, and is a friend of Belhaven having been our commencement speaker and receiving an honorary doctorate from us. He has done an outstanding job leading the movement. I was privilaged to serve as chair of the search committee to find Doug’s replacement and I couldn’t be happier with the outcome God has brought together for us all in the evangelical world. Below is the announcement, including my quote about another great friend of Belhaven Dr. Michal Oh, who will be our new Lausanne Executive Director / CEO. LONDON, 5 February 2013 – The Lausanne Movement announced today it has appointed Dr. Michael Oh, a 41-year-old Korean-American, serving in Japan, as its new Executive Director/Chief Executive Officer, effective 1 March. Oh is president and founder of Christ Bible Seminary in Nagoya, Japan, a vibrant and growing seminary in Japan, which is making an impact among young Christians seeking a renewed vision for the next generation of Christianity in Japan. He has been involved in Lausanne since 2004, serving as keynote speaker and part of the planning team for Lausanne’s Younger Leaders Gathering in 2006, and as a member of the Lausanne Board since 2007. He will be formally installed at The Lausanne Global Leadership Forum in South Asia in June. Oh succeeds outgoing CEO Rev. S. Douglas (Doug) Birdsall, who becomes the president of American Bible Society on 1 March. Birdsall further indicated that he believes Oh understands the value of Lausanne’s rich history, and as a younger leader has demonstrated the ability to inspire and enlist a new generation of men and women around the globe who share Lausanne’s commitment to “the whole church taking the whole gospel to the whole world”. “Lausanne is in good hands, and the future is filled with promise,” Birdsall added. After passing the baton of leadership to Oh, Birdsall will continue to serve in leadership with Lausanne as an Honorary Chair. Oh’s appointment was welcomed by leaders in Japan who expressed pleasure that Oh will live in Japan while serving Lausanne. “We are committed to expanding the network of support and prayer among churches in Japan for Michael. As a board member of the Japan Evangelical Association, I know that General Secretary Kenichi Shinagawa has shared a longtime friendship with Michael. I am strongly encouraged that, upon hearing the news of his friend’s new appointment, Rev. Shinagawa has indicated his willingness to lead the Japanese Church in our serving together for the advancement of the kingdom of God,” stated Rev. Dr. Satoru Kanemoto, Chair of the Japan Lausanne Committee. Dr. Lindsay Brown, Lausanne International Director, is encouraged about the future because of Oh’s selection. “I look forward to working in partnership with Michael with the goal that ‘all the earth may hear His Voice,'” Brown said. Brown has committed to continue serving as International Director until 2015 to assist in the leadership transition. Oh has a Doctor of Philosophy with a specialization in Cultural Anthropology and Education (University of Pennsylvania), a Master’s Degree of Arts with a concentration in East Asian Studies (Harvard University), a Master’s Degree of Divinity with an emphasis on Missions (Trinity Evangelical Divinity School) and a Master’s Degree of Science (University of Pennsylvania). Michael and his wife, Pearl, have been married 18 years and have five children. Lausanne is a global Movement that mobilizes evangelical leaders to collaborate for world evangelization. It grew out of the 1974 International Congress on World Evangelization convened in Lausanne, Switzerland by Rev. Billy Graham and Bishop Jack Dain. The Third Lausanne Congress on World Evangelization (October 2010) in Cape Town, South Africa brought together 4200 Christian leaders, representing 198 countries. The resulting Cape Town Commitment (www.lausanne.org/ctcommitment) serves as the blueprint for the Movement’s activities. Lausanne is convening four to five Consultations each year around the issues articulated in The Cape Town Commitment. More information is available at www.lausanne.org. For further information, please contact Naomi Frizzell, nfrizzell@lausanne.org, +1.904.262.5202. Saturday night rhe Mississippi Symphony Orchestra presented “Mozart by Candlelight,” to an overflow house at our Center of the Arts. Dr. Stephen Sachs, Professor of Piano and Music Department Chair, was the featured pianist for Mozart’s masterpiece Piano Concerto No. 24 in C Minor. The standing ovation following his performance brought an encore from Dr. Sachs as well. It was a magnificent performance! 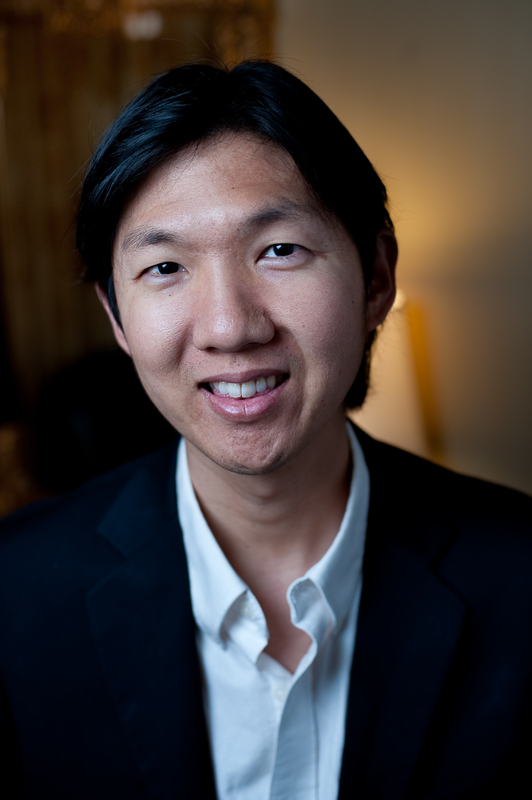 The Mississippi Symphony Orchestra also includes key players who serve on our faculty: Mr. Song Xie, Associate Professor of Music; Mrs. Nancy Bateman, Adjunct Cello professor; Mrs. Sybil Cheesman, Adjunct Flute professor. NASAD is the national organization that accredits the 322 universities who have met their standard of excellence. Belhaven has held NASAD accreditation for many years. This accrediting body works with Visual Arts, but here are mirror organizations in each of the other primary Arts: Music, Theatre, and Dance. Belhaven University is one of only 30 Universities in America whose four primary Arts programs are all independently accreddited.